Posted on Wed, Feb 22, 2012 : 11:30 a.m. There are all sorts of odd food holidays, and today's honorary occasion — National Cook a Sweet Potato Day — has to be fairly close to the top on that list. But since sweet potatoes are so nutritious — high levels of vitamin C, potassium, and beta-carotene combined with a low glycemic index — no one should argue with some incentive to eat them more often. They're not just for Thanksgiving, and they don't need to be served with marshmallows on top! I'm not sure what inspired this dish, which features gnocchi ([nYO-kee] — potato dumplings) served with a creamy sweet potato sauce. The notion simply popped into my head, so that's what I made — I have no other explanation. It's remarkably rich and delicious, but not heavy. Its vibrant color is particularly appreciated in the midst of winter's dreariness, while its warmth and comfort provide sustenance. All in all, a rousing success! Place sweet potato cubes into a medium saucepan and cover with water; bring to a boil, then cook over medium-high heat for 25 minutes until sweet potatoes are tender. Drain water. Return sweet potatoes to the saucepan and mash them roughly. Turn heat to low. Whisk in butter, milk, wine, salt, pepper and nutmeg; cook, stirring occasionally, while preparing gnocchi. Bring a pot of water to boiling; add gnocchi and cook according to package directions. Drain. 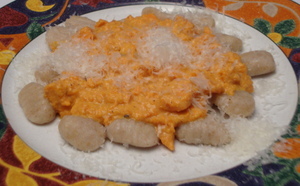 Place gnocchi onto a serving platter, and spoon sweet potato sauce over them. Sprinkle with cheese and serve immediately. Thu, Feb 23, 2012 : 12:27 a.m. Looking at the list of ingredients and their amounts, what you have is mashed sweet potatoes over gnocchi. I would not call the sweet potatoes a sauce, but rather a starch. The amount of liquid would be quickly absorbed into the potatoes making them into a one lump mass. I'm with you on this one, Mary. I think the primary reason the dish photographs poorly for some is the color of the whole-wheat gnocchi which has (as all whole-wheat pasta does) a brownish-gray color. Nonetheless, while pasta made with refined flour might &quot;look&quot; better, I know it for its high-glycemic, low nutritive characteristics, so whole-wheat (or other whole-grain) pasta is always my first choice when available. And, as you note, sweet potatoes are highly nutritious (see <a href="http://www.foodreference.com/html/sweet-pot-nutrition.html" rel='nofollow'>http://www.foodreference.com/html/sweet-pot-nutrition.html</a> for more details). I agree with you that the combination of the whole-wheat pasta and sweet potatoes is an interesting one. I look forward to trying it myself. I applaud your attempts at innovation in the kitchen, and the practicality of your recipes. Thanks! Wed, Feb 22, 2012 : 8:41 p.m. Wed, Feb 22, 2012 : 5:42 p.m. Wed, Feb 22, 2012 : 8:36 p.m.
Good looking food does, indeed, photograph well; but some of the most delicious foods are simply not supermodels. I apologize if I misinterpreted your comment; but I took the statement &quot;I also find that the ingredients are definitely out of the mainstream ...&quot; to mean that recipes offered either involve unusual ingredients or are cost-prohibitive, so I was replying to that. My background is in cooking contests; in order to win, it was essential to offer recipes that people from Hawaii to Nebraska to Virgina could make, with universally accessible ingredients, and I strive to still utilize that philosophy. Wed, Feb 22, 2012 : 8:23 p.m. I'm sorry to have put you on the defensive. Good looking food does photograph well and entices the reader to want to make the recipe. The photo looks like it was taken with a cellphone, i.e. low pixels. As for the recipe; I make my sweet potatoes in a similar way, but adding wine and pouring them over pasta stuffed with white potatoes just seems silly. I never suggested that good food needs to be expensive or &quot;sought&quot; out, just appetizing. Wed, Feb 22, 2012 : 7:44 p.m. Wed, Feb 22, 2012 : 7:29 p.m. I have to agree that the photo looks extremely unappetizing. I find that annarbor.com's food photos are frequently unattractive. I also find that the ingredients are definitely out of the mainstream in my opinion. The Ann Arbor News had wonderful Food Sections. The food looked and tasted great. I'm sorry, I have felt this for a very long time about the current food section.